NBC News has announced it is bringing back “Democracy Plaza” to New York City’s Rockefeller Center for its 2012 election night coverage. Democracy Plaza is set to open Tuesday, Oct. 30 and remain open through election night. Visitors will be able to see replicas of the Oval Office and White House briefing room and participate in interactive video booths or have a their caricature created by a roving artist. As in years past, the Rockefeller Center ice skating rink will boast an electoral map that will be colored in as each state is called throughout the night. In addition, suspended buckets trailing fabric representing Republican and Democratic electoral vote tallies will once again climb the side of 30 Rockefeller Plaza. Surrounding the rink will be broadcast booths for NBC News, MSNBC, CNBC, Telemundo, local affiliate WNBC-TV and the network’s affiliate news service. 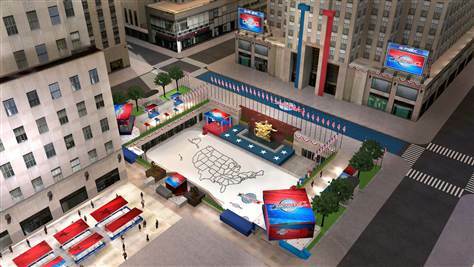 The Democracy Plaza concept was used for the 2004 election, but the network opted for a scaled down “Election Plaza” for its 2008 coverage. That version omitted the exhibits but still included the ice skating rink map and suspended buckets. NBC also used Rockefeller Plaza for its 2011 Education Nation “Learning Plaza” initiative. It’s interesting to note that in the rendering released by NBC, seen above, there appear to be some key differences in layout this year, keeping in mind that the rendering may not illustrate the final design. Most notably, no large screen is placed above the sculpture of Prometheus as in years past. This screen was used to display the electoral college map and served as the focal point of the broadcast booths flanking the rink. It’s also worth noting that the largest booth appears to be on one corner of the rink, with only a small booth in the center directly in front of the statue. In the past, NBC News has taken the prime spot at the center, with the sister networks and channels using the side areas, so it will be interesting to see how the networks are positioned this year, especially given the MSNBC’s use of Studio 8G for its political coverage this year.